The TESS spacecraft's job may have just gotten a little easier. Artist's illustration of NASA's Transiting Exoplanet Survey Satellite (TESS), which is hunting for exoplanets around stars close to the sun. 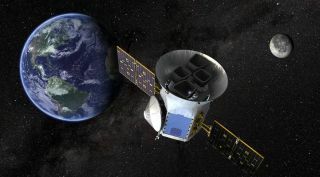 Astronomers have put together a "habitable planets catalog" for the Transiting Exoplanet Survey Satellite (TESS), in an attempt to help the spacecraft's hunt for potentially Earth-like worlds. "Life could exist on all sorts of worlds, but the kind we know can support life is our own, so it makes sense to first look for Earth-like planets," TESS science team member Lisa Kaltenegger, a professor of astronomy at Cornell University in New York and director of the school's Carl Sagan Institute, said in a statement. "This catalog is important for TESS, because anyone working with the data wants to know around which stars we can find the closest Earth analogs," added Kaltenegger, who led a new study announcing the catalog. TESS launched to Earth orbit atop a SpaceX Falcon 9 rocket in April 2018. The spacecraft is searching for exoplanets around nearby stars by looking for tiny brightness dips caused when these worlds cross the faces of their host stars from TESS's perspective. TESS, whose haul may ultimately exceed Kepler's, is expected to observe about 400,000 stars during its two-year prime mission. Not all of those stars were created equal from the mission's perspective, and that's where the new catalog comes in. The team further highlighted 408 stars where TESS could find such a presumably temperate planet that's about Earth's size — again, in one transit. The catalog includes 137 stars that NASA's $8.9 billion James Webb Space Telescope will be able to view continuously, the researchers said. James Webb, which is scheduled to launch in 2021, will be able to characterize the atmospheres of some nearby exoplanets — work that will include searching for possible "biosignature" gases such as oxygen and methane. "We don't know how many planets TESS will find around the hundreds of stars in our catalog or whether they will be habitable, but the odds are in our favor," Kaltenegger said. "Some studies indicate that there are many rocky planets in the habitable zone of cool stars, like the ones in our catalog. We're excited to see what worlds we'll find." The study was published late last month in The Astrophysical Journal Letters.